For other uses of "bumper", see Bumper. Two views of a Hayes-built bumper at the Linden Railroad Museum, Linden, Indiana. This design accommodates the AAR coupler. This buffer stop is designed to move up to 7 metres (23 ft) to slow down an 850-tonne (840-long-ton; 940-short-ton) passenger train from 15 km/h (9.3 mph) without damaging the train or injuring passengers. The design of the buffer stop is dependent, in part, on the kind of couplings that the railway uses, since the coupling gear is the first part of the vehicle that the buffer stop touches. The term "buffer stop" is of British origin, since railways in Great Britain principally use buffer-and-screw couplings between vehicles. Several different types of buffer stop have been developed. They differ depending on the type of coupler used and on the intended application. Buffer stops with anticlimbers. These are particularly important for passenger railway applications, because the anticlimbers prevent telescoping of the railroad cars during a head-on impact. If there is extra room behind the bumper block, there is usually a sand or ballast drag that is designed to further retard a runaway train. One such accident occurred when a Northern Line train powered past the bumper block at Moorgate station in 1975 on the London Underground system. Largely because of its mass, a train transfers an enormous amount of kinetic energy in a collision with a buffer stop. Rigid buffers can safely cope only with very low-speed impacts (i.e., nearly stationary). To improve stopping performance, a way of dissipating this energy is needed, through compression or friction. Following a buffer stop accident at Frankfurt am Main in 1902, the Rawie company developed a large range of energy-absorbing buffer stops. Similar hydraulic buffer stops were developed by Ransomes & Rapier in the UK. When it is desired to slow or stop moving trains, without erecting a solid buffer stop, dowty retarders may be employed. They press upwards against the wheels, and may optionally be turned off as required. Stopping distance: 20 m (66 ft). Wheel stops or car stops are used to stop small numbers of light vehicles at the end of level storage tracks or to chock individual vehicles on shallow grades. 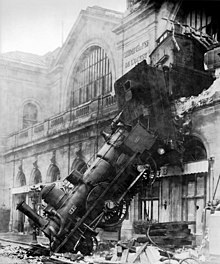 22 October 1895 – Gare Montparnasse, Paris, France – express train overruns buffer stop and falls into street below. 4 April 1901 – at the Top Points of the Lithgow Zig Zag, a train lost control on the 1 in 42 (2.381%) gradient and failed to stop at the buffer stops, coming to rest overhanging Ida Falls Gully, with an immediate 200 ft (61 m) drop in front of the engine. 1902 – Frankfurt am Main, Germany – Serious buffer stop collision inspires development of Rawie range of energy-absorbing buffer stops. 1948 – diesel train through buffer stops at Los Angeles. 15 January 1953 – Union Station, Washington, D.C. – Federal Express No. 173, pulled by PRR 4876, overruns the stop after its brakes fail. The locomotive enters the concourse of the station building before falling through the floor. A temporary floor was built over the hole and locomotive for the upcoming inauguration of Dwight D. Eisenhower before the locomotive was cut into three pieces and shipped to Altoona, Pennsylvania, for repairs. 1972 – BART train went through buffer stops due to fault in automatic train operation. 28 February 1975 – Moorgate Underground rail crash – 43 killed, 74 injured – buffer stop collision made far worse by small size "tube" train running into large dimensioned dead-end tunnel beyond. The tunnel could accommodate full-size surface stock thus permitting the smaller train to concertina inside the tunnel. 13 April 1978 – Budapest, Hungary – commuter train overruns a buffer stop owing to brake failure and crashes into the station building. 16 killed, 25 injured. 8 November 1986 – Hua Lamphong, Bangkok, Thailand – 5 killed, 7 injured – buffer stop collision made by an unmanned train at a speed of 50 km/h (31 mph). 8 January 1991 – Cannon Street station rail crash, London – 2 killed, 200+ injured – commuter train hits buffer stops. 11 July 1995 – Largs – Class 318 EMU goes through buffer stops. 24 July 2001 – ScotRail commuter train hits the buffers as it pulls into Edinburgh Waverley injuring seven people. 26 October 2006 – Kuala Lumpur, Malaysia – a Star LRT train goes through buffer stops at the end of a stabling area (turnback perhaps) and ends up dangling over street. The train appears to have been empty of passengers. 21 December 2009 – Zagreb, Croatia – commuter train number 5100 from Sisak Caprag crashes into the platform bumper. The cause was antifreeze fluid in the locomotive's braking system which had frozen because of the extremely low outside temperature (−22 °C or −7.6 °F). Luckily, the speed of the train was only between 15 and 20 km/h (9.3 and 12.4 mph). 60 people from the train (including train's engineer) were injured, 7 of them seriously. There were no injuries among people on the platform. The engineer leaned out of the cab window to warn people on the platform that his brakes had failed and that the train would crash at the end of the platform. 25 July 2010 – Stavoren railway station, the Netherlands – A maintenance train collided with a buffer stop at the single-track terminus station. The train rammed a small shop, passed through it and stopped at the square behind it. Only two people were injured, out of four people on the train. The accident happened late at night, when passenger services had already finished. The cause is being investigated. 1 January 2011 – Malmö, Sweden – An X 2000 train reverses into the buffer stop. The last car telescopes over the power unit. The driver was the only person on board the train. He sustained minor injuries. 2 March 2011 – San Francisco 4th and King Street Station, San Francisco, California – A Caltrain commuter train failed to stop before hitting the buffer stop. Multiple minor injuries were reported. 8 May 2011 – Hoboken Terminal, New Jersey – A Port Authority Trans-Hudson rapid transit train crashes into a bumper. At least 34 were injured, none critically. The collision was attributed to driver error and lack of an on-board speed control system. 22 February 2012 – Buenos Aires, Argentina – a commuter train collided with buffer stops at a train station in Buenos Aires during the morning rush hour. The accident killed 51 people and injured more than 700 in Argentina's worst rail accident in 30 years. The buffer stops do not absorb energy. 15 January 2013 – Saltsjöbaden, Sweden – A cleaning lady accidentally set a four-car EMU commuter train in motion while cleaning it at the Neglinge depot. It reached 80 km/h and demolished a buffer stop at Saltsjöbaden station before crashing into a small apartment block about 25 m beyond the end of the track, badly injuring the cleaning lady. 31 January 2013 – Brisbane, Australia – A train failed to stop at the end of the line at Cleveland railway station. The train overshot the buffer stop and ran into station building. A number of people were treated for minor injuries. 15 April 2013 – Wellington, New Zealand – A Matangi EMU fails to stop at the Melling Railway Station and collides with the buffer stop. No injuries reported. In November 2013, a Class 221 Virgin Train overran the buffers at Chester. Minor injuries occurred, with one man being taken to hospital for checks. 24 March 2014 – Chicago, Illinois – A Chicago Transit Authority passenger train overran the bumper at O'Hare Subway Station, with the front car of the eight-car train partially ascending an escalator. 32 people were injured in the incident. 20 March 2015 – Uttar Pradesh, India – The Dehradun-Varanasi Janata Express derailed near Bachhrawan, resulting in at least fifty-eight deaths and 150 people being injured. The driver reported by radio that the brakes on the train had failed, and that he could not stop the train. It was diverted into a siding and crashed through the buffers at Bachhrawan. 26 April 2015 – Cairo, Egypt – A Cairo Metro train crashed into the buffer stop and derailed at Abbassia station on line 3, the train crashed while it was coming out of maintenance on a branch line and going back to the main rail, the driver sustained injuries with no injuries among the passengers. 28 June 2015 – Mumbai, India – A local train crashed into a buffer on platform no. 3 of Churchgate station in Mumbai. 6 people were injured in the accident. The hydraulic buffer used to slow the impact did not function and the train overshot the platform. 17 September 2015 – London, England – A Thameslink train crashed into a buffer at King's Cross station on platform 11 at 12.18. The train had been pulling into the station at low speed when the train hit the buffer. Five people were treated for minor injuries & two were taken to hospital. 9 April 2016 – Karlstad, Sweden – A chartered train reverses into the buffer at Karlstad Central Station on platform 20 at 14:50. The last car of the train telescoped over the buffer, stopping a few meters short of a nearby convenience store. No passengers were aboard the train during the accident but one staff member was treated for minor injuries. 29 September 2016 – Hoboken, New Jersey The cab car of a NJ Transit Pascack Valley Line commuter train entering Hoboken Terminal overran the buffer block on track five at 8:45 am. The train continued across the low-level passenger concourse connecting the platforms and slammed into a wall of the terminal building, causing serious structural damage. One person was killed and more than 100 were injured. 28 July 2017 – Barcelona, Spain – A train failed to stop at Francia station and hit the buffers. The accident happened at 07:15 (05:15 GMT) after the train had travelled from the village of Sant Vicenç de Calders, some 60 km (37 miles) to Barcelona's south-west. 54 people were reported injured. 22 January 2018 – Sydney, Australia – 16 people were injured after a train hit a buffer stop at the end of the rail line at Richmond railway station in Western Sydney. The accident occurred at around 10:00 am. ^ "Infrastructure (Iran)". Railway Gazette International. 1/2009: 16. January 2009. ^ "Aldon railcar wheel stops". ^ "Rails Company - Wheel Stops". ^ "Western Cullen Hayes Wheel and Car Stops". ^ "Framework". Los Angeles Times. ^ "A Csepeli Hév fekete áprilisa – 33 éve történt a tragikus HÉV baleset". Retrieved 11 November 2012. ^ Chow, Vincent. "Derailment of Malaysia LRT". Vincent Chow dot Net. Archived from the original on 2011-12-06. Retrieved 14 December 2011. ^ "Nakon udara, kaos. Putnici su letjeli po zraku. Neki su cijeli bili prekriveni krvlju". jutarnji.hr. Retrieved 17 April 2018. ^ "Two hurt as maintenance train ploughs through shop". DutchNews.nl. 26 July 2010. Retrieved 14 December 2011. ^ Radio, Sveriges. "Train crashed into buffers at Malmö Station – Radio Sweden". sverigesradio.se. Retrieved 17 April 2018. ^ Keeling, Brock (2 March 2011). "Accident at 4th & King Caltrain Station Sends Passengers to Hospital". sfist.com. Archived from the original on 17 May 2016. Retrieved 14 December 2011. ^ Fenton, Reuven (8 May 2011). "Dozens hurt after PATH train crashes into Hoboken platform". New York Post. Retrieved 14 December 2011. ^ Cowan, Alison Leigh (8 May 2011). "Dozens Injured as Train Crashes in New Jersey". The New York Times. Retrieved 14 December 2011. ^ Rutherford-Morrison, Lara (29 September 2016). "The Last Hoboken Train Crash Happened in 2011 Due To Mechanical Failure". Bustle.co. Retrieved 5 October 2017. ^ "Argentine train crash kills 49 people, hurts 600". Yahoo.com. 22 February 2012. Retrieved 22 February 2012. ^ "Stockholm train crashed into apartments 'by cleaner'". BBC News. January 15, 2013. ^ "Collision between passenger train and platform at Cleveland, Qld, 31 January 2013". ^ "Passengers 'jolted' after train collision". Fairfax NZ. April 15, 2013. ^ "Passenger taken to hospital after Chester collision". RailNews. 20 November 2013. Retrieved 22 November 2013. ^ "Train crashes into Chester Station barrier". BBC News. BBC. 20 November 2013. Retrieved 22 November 2013. ^ Esposito, Stefano; Rossi, Rosalind; Owen, Jordan; Slefo, George P. "Blue Line train derails at O'Hare, climbs up escalator; 32 hurt". Chicago Sun Times. Retrieved March 24, 2014. ^ Mahesh, Niha. "32 Die as Train Derails Near Rae Bareli in Uttar Pradesh, 50 People Injured". NDTV India. Retrieved 20 March 2015. ^ Srivastava, Piyush (22 March 2015). "UP train crash death toll rises to 58 as driver reveals his SOS alerts were ignored". London: Mail Online. Retrieved 22 March 2015. ^ "1 injured as metro train crashes near Abbaseya station". Daily News Egypt. 26 April 2015. Retrieved 26 April 2015. ^ "Egypt's underground metro goes off rail, crashes in wall". Ahram Online. Al-Ahram. 26 April 2015. Retrieved 26 April 2015. ^ "Five hurt as train hits buffers". BBC News. 17 September 2015. Retrieved 17 April 2018 – via www.bbc.co.uk. ^ "Olycka på Centralstationen". nwt.se. Retrieved 17 April 2018. ^ "Train crash in Barcelona injures 54". BBC News. 28 July 2017. Retrieved 17 April 2018 – via www.bbc.co.uk. ^ "People injured after train crash at Richmond station". msn.com. Retrieved 17 April 2018. Wikimedia Commons has media related to Buffers.